The Shah family called us with an inquiry about a custom patio arrangement to accentuate their beautiful Glen Ellyn home. I met with them and they conveyed their wish list that included a multi-level layout with a cooking area, intimate seating area, and an outdoor room for dining. Together, we developed a concept and plan to build their dream patio. We discussed the benefits of utilizing different paving materials to achieve a separation of spaces, and using natural stone as decorative accents and to connect the various areas. Due to water drainage concerns, I suggested a new Unilock product that simulates old street pavers but installs as traditional brick paving or as a permeable paver application. After finalizing the design, material options and budget considerations, we were ready to submit our application for the building permit. The initial response from the building department engineer was of concern regarding additional storm water runoff in an already troubled area. I was able to satisfy the building department’s requirements by recommending the installation of Unilock’s Town Hall Pavers that features a permeable gravel base that satisfactorily decreases the runoff. The results speak for themselves… a beautiful and fully functional back yard setting that the Shah family will enjoy for years to come. Several heavy downpours that occurred shortly after the project completion drained exactly as anticipated, with no problems or incidents. 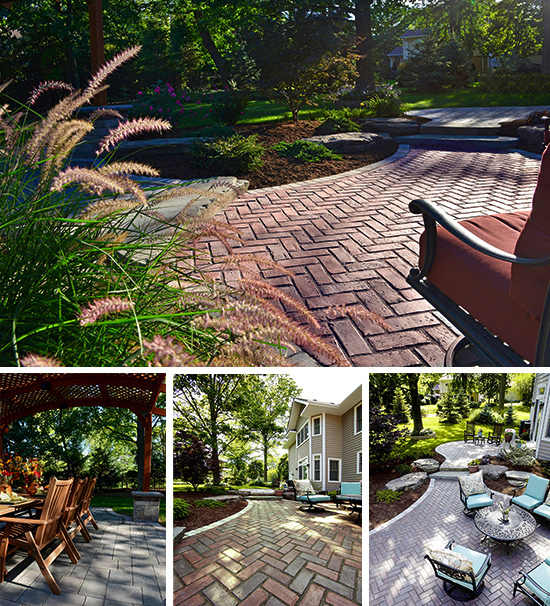 Unilock concurred that the results of this project were stellar by naming Landscape Creations as the winner of their top award for permeable paver application. Each homeowner has individual preferences and needs for their outdoor space. This project is an excellent example of how Landscape Creations can create award winning landscape designs, while addressing any additional site concerns. We do it right the first time. Call us today at 630-932-8966 to schedule a free consultation, or visit our contact page. We will work attentively to transform your outdoor living space into a haven of beauty and enjoyment for years to come. I like the idea of using paved stone in a landscape setting. I don’t mind mowing, but it would be nice if I didn’t have to mow quite as much. The paved areas seem like they are a lot less maintenance. That is the draw for me.